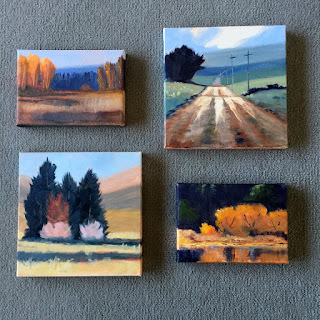 This is a collection of little landscape from this week: two sizes 5x7 and 8x8. All are on stretched canvas and were completed with oil paints. I like to do these little studies before creating larger works. Sometimes they don't translate well into a larger painting and sometimes they are great. 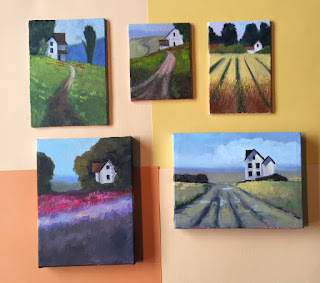 The small original paintings are offered for sale in my Etsy Shop and, if they make it to a larger format, they are offered for sale at Ugallery. A couple of these are already in my Etsy Shop. I'm still processing thoughts on larger possibilities. What do you think? The colors of fall are starting to show and are inspiring my landscape work. Red, orange, and gold are dominating the scenery all over the Northwest and demanding that my paintbrush replicate their beauty. I enjoy the cooler weather and the lack of crowds in all my favorite places. Although this painting was completed with acrylic paints, my oils are also getting a workout, too. After the paint dries on my latest series, the originals will be displayed here, at Ugallery. Prints are available from my print shop, here. 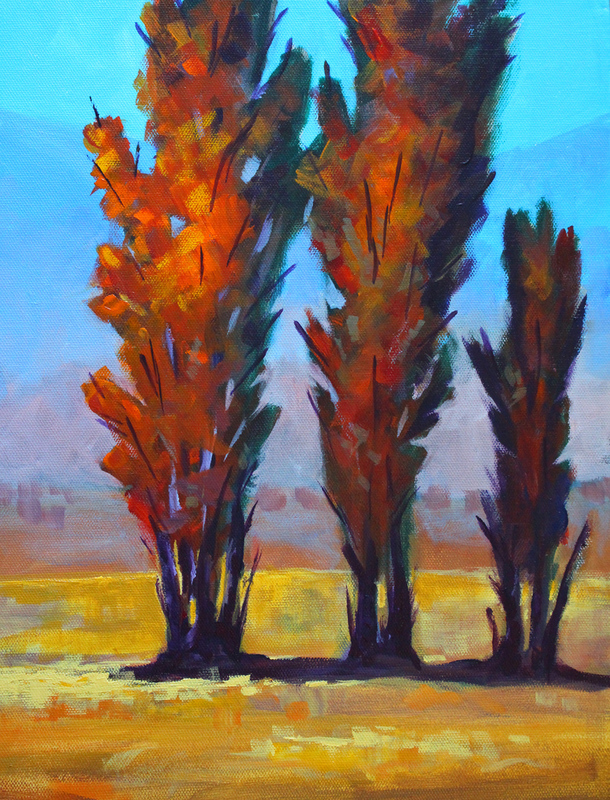 I'm looking forward to sharing my recent autumn landscape painting adventures. More to come! This was little house week. Here is a sampling of some of the little landscape studies I've been working on. Usually my landscapes are void of buildings, but not this week. I've been auditioning some little cottages for possible larger work. The largest in this collection are 6x8 inches and the smallest was 4x5 all completed in oils on stretched canvas or canvas panel. I've listed one for sale in my Etsy Shop. The others will follow as soon as the paint is dry. I'll be contemplating whether to take them large or just leave them as small studies. What do you think?